Is it a car? Is it a bike? The Zerotracer is hard to define, but we know one thing: it’s fast. It can go beyond 180-mph! As it is still a work in progress, the engineers have electronically limited it to 155-mph, but that is fast enough for the Zero Race where it will undoubtedly shine. 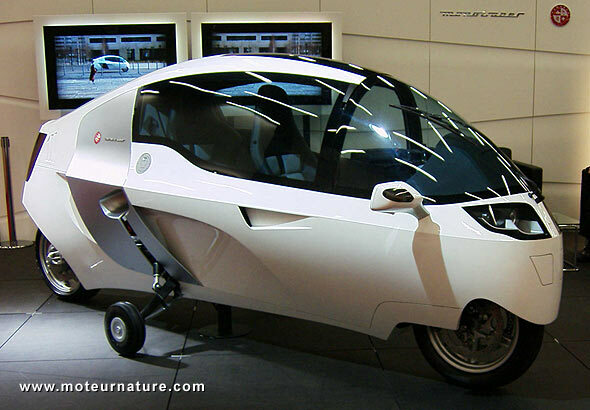 Based on the Swiss Peraves Monotracer (picture below from the Geneva motorshow in 2007), the gasoline version, the Zerotracer which is also Swiss, with a Brusa motor. It’s the latest evolution of a vehicle with more than 10 years of development behind it. The original idea was to mix the small frontal area of a motorbike with the slippery shape of a whole-bodied vehicle. The Zerotracer has a Drag Coefficient of .18 and a low weight thanks to a kevlar monocoque. Watch the video below to learn more about it.